This post was originally published in 2016 and has been updated with new and improved tips for 2019! Instagram is my FAVOURITE social media platform. It allows you to show off your personality and artistry, and if you’re a blogger or any type of creative, it can be a total game changer! Before I understood the real power of Instagram as a blogger, I would post whatever pictures I wanted. I used the built-in Instagram filters and tried to make them look pretty, but I didn’t have a real vision, plan, or theme. 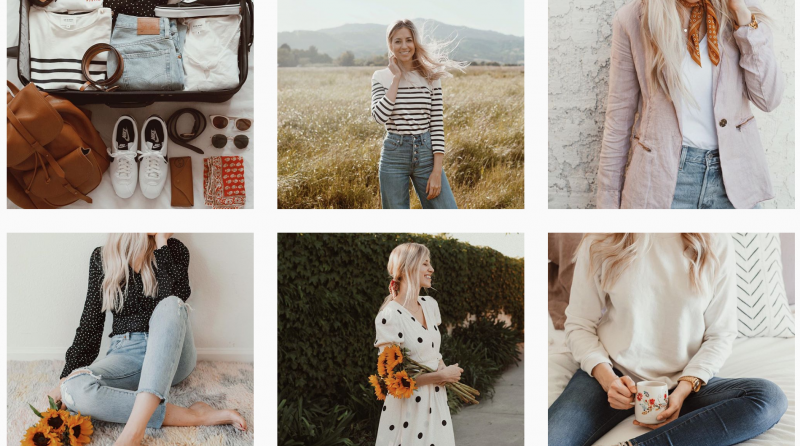 After a couple years of on-and-off experimenting with the platform I’ve learned how to create an Instagram theme to grow your following and make your followers want to double tap. 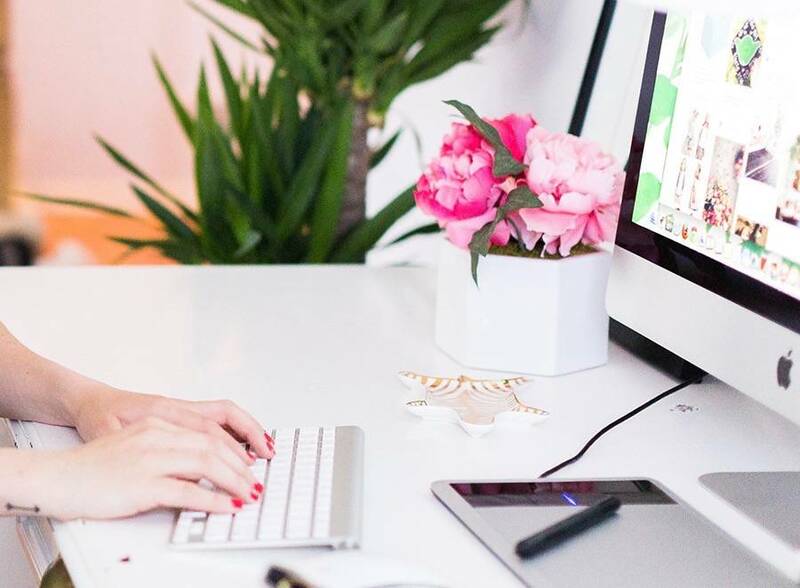 If you’re an type of creative, Instagram can help you grow your personal brand like none other! And an important part of any brand is finding a theme and sticking to it. This way, people will come to recognize you and your aesthetic, whether it’s in real life or online. For example, as you can tell from my blog, I really love a clean template, with bright, colourful accents and photos. 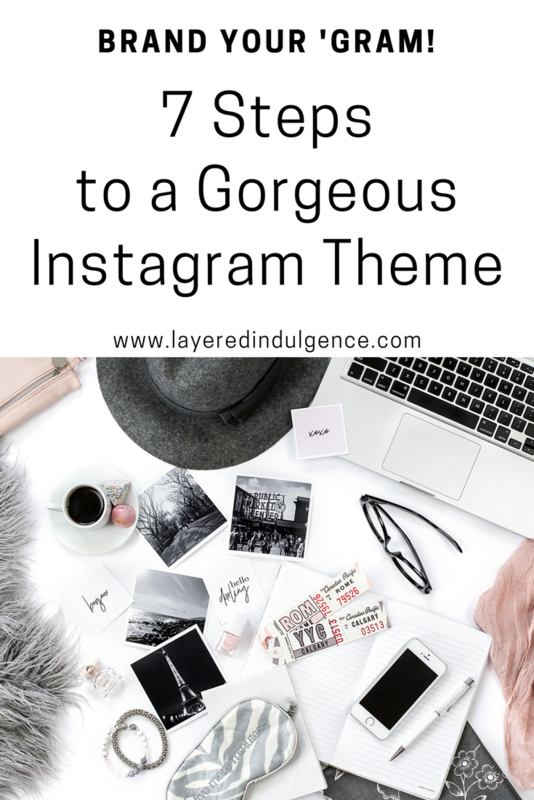 This theme is carried through on my Instagram and Pinterest accounts. I hope that when people visit each of these places, they can get a real feel for “me” wherever they are! Over the past couple years I’ve worked on and grown my Instagram account to 13K+ followers, and theming my account has been one of the biggest things I attribute this to. I often get asked how I make my page look so nice and how I’m able to make all the photos look so good together. So today I’m going to let you in on some of my Insta-secrets so you can start growing your account too! As you can see, all of these pages are colourful, airy, feminine and crisp. 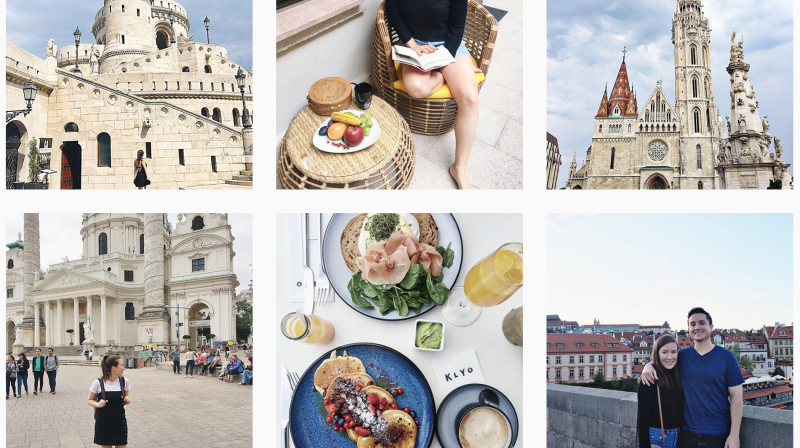 I’ve picked up tips from all of these accounts, from how to angle food photos to what backdrops look best for style shots. Take a look at your favourite Instagram pages. What is it about them that you absolutely love and makes you want to follow and come back for more? Whatever it is, start implementing these things into your own photos and your theme is sure to blossom! Think about the photos you’re posting. What’s going to look best on your page? Will the photo fit with your theme? Does it fit with your colour scheme? If not, it’s probably best not to post it. And don’t post a photo just to post a photo. 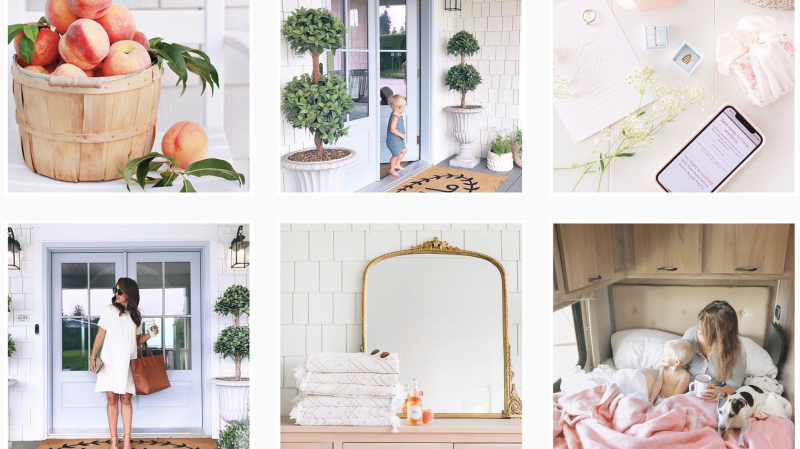 Most successful Instagram pages have nicely photographed pictures of pretty objects, landscapes, desktops, etc. 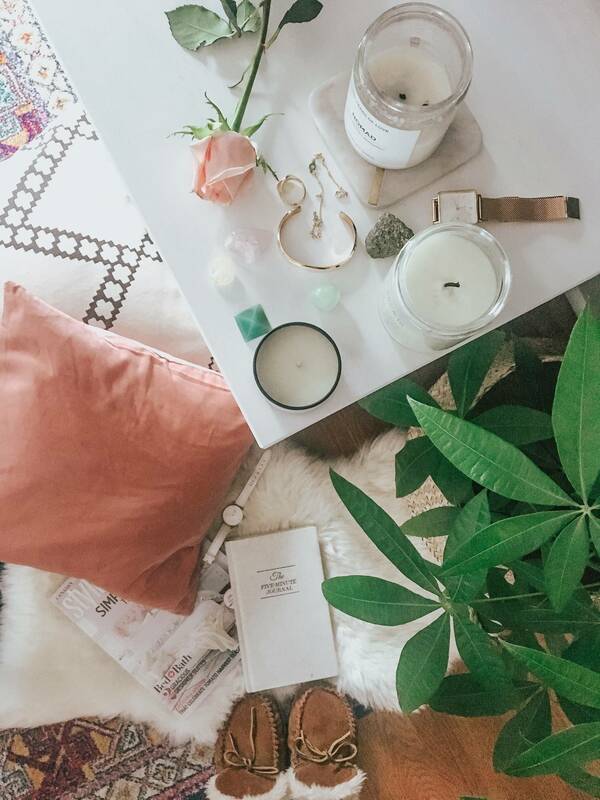 Take the time to create nice flat lays or move things around until you have proper lighting and your objects are organized in the most flattering way. It truly makes a world of difference! PS. Not a strong photographer? I recommend investing in a stock photo membership like Haute Stock. I use these photos when I don’t have time to snap a branded photo or if I feel a lack of creativity. They’re perfect if you’re looking for gorgeous, styled (and affordable!) photos that you can use on your social media platforms. They’ve helped grow my Instagram so much! 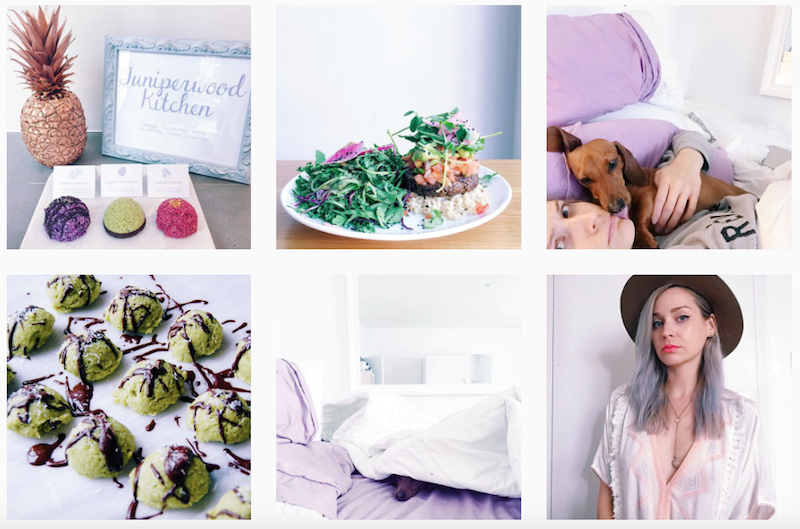 Having a consistent colour scheme will do wonders for your Instagram theme! If you take a look at Blueberry Pancake, you’ll notice there are a lot of purples, pinks, and greens on her page. For me, I’ve been trying to stick with pinks, blues and greens, but it doesn’t always happen. I think if you stick to similar colours, or make sure all your colours are brights or pastels, for instance, it can work wonders! I used to think spending money on an editing app was totally ridiculous. Then I saw what a difference it could make and jumped on the app train RIGHT away. I use PicTapGo to edit my photos and it has been LIFE changing (you know, in a social media kind of way)! It’s only $1.99, so it’s really not a huge investment for something so magical. They have a bunch of different editing filters, as do many other apps such as VSCO Cam, which is another blogger favourite. When using editing apps, stick to the same filters each time you edit your photos so they’re consistent to your theme. I use 2 to 6 of the same filters each time when editing on PicTapGo and that keeps my photos looking consistent and on brand! I think this pretty much goes for every Instagram page, but bright photos always look better than dark and saturated ones. People are visual creatures and our eyes are drawn more to bright, beautiful photos. That’s just how it works! If you use an editing app, you can brighten your photos, but good lighting is always key! If you can, take photos with natural light as it will always look better than indoor lighting. Having bright photos is sure to help your Insta-theme! I honestly hate deleting photos, but if I post a photo and it doesn’t fit in with the rest of my page, I delete it. And it always makes a huge difference – in a good way. Sometimes I’ll re-edit it and try to make it fit the overall theme, but other times I know it’s just not going to work. It could be due to bad lighting, saturation, or whatever else, but if it doesn’t work, it’s gotta go! This one really depends on you and your brand, but posting photos of the same thing (ONLY food, ONLY fashion, ONLY fitness) can establish you as an expert and make your page look great! Since I’m a lifestyle blogger and cover multiple topics I don’t do this (nor would I be able to post that much of ONE thing) but it works really well for recipe bloggers like Kale and Caramel, for example. 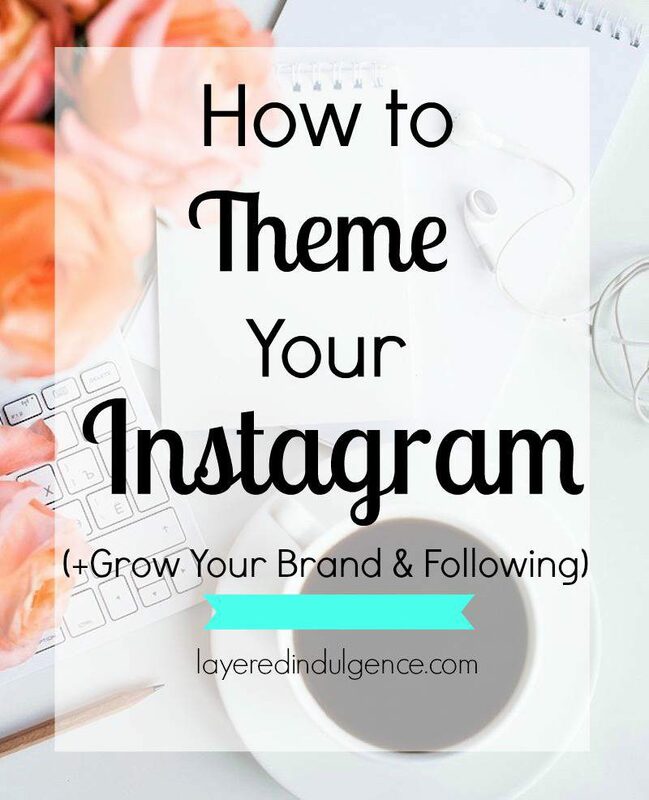 Instagram is fun, mildly addicting, and if used strategically it can really help to grow your personal brand! 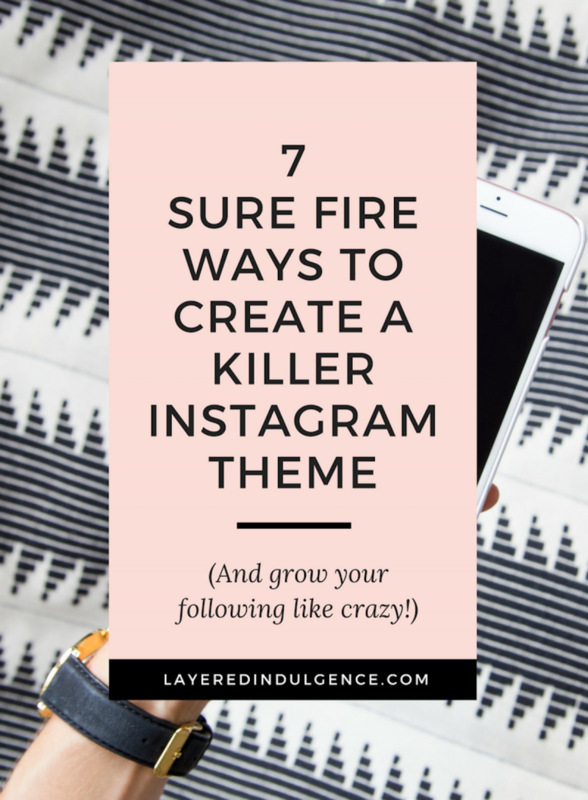 Theming your page is the first step and I hope these tips have helped! If you want to check out my page, you can click here and say hello! 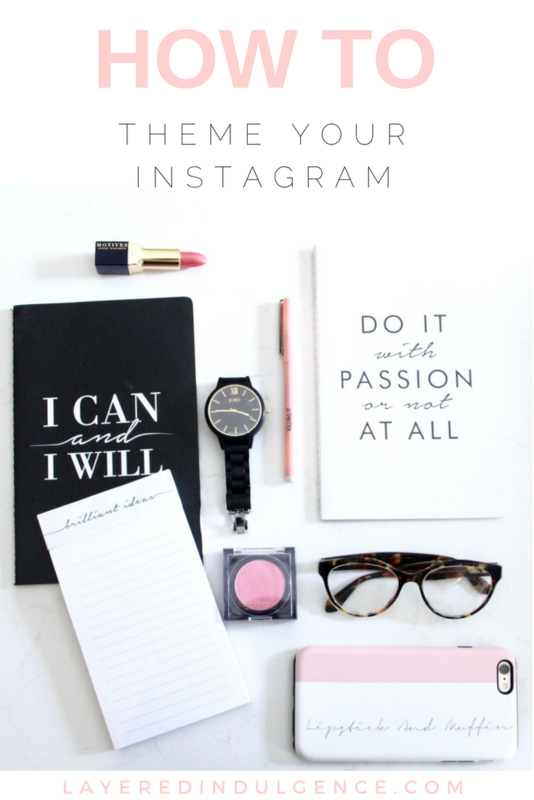 And if you have any more tips for how to theme your Instagram, let me know in the comments below, with a link to your page so I can check it out! 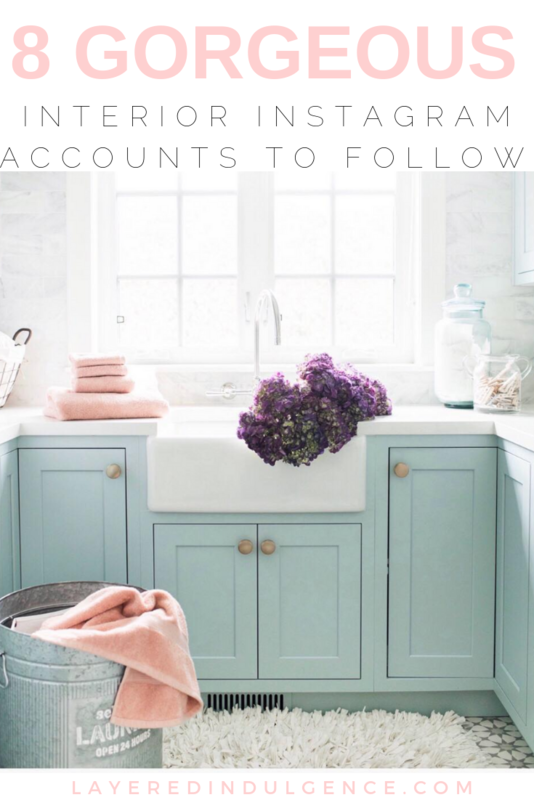 And if you’re looking for even more awesome Instagram tips, make sure to follow my Instagram board on Pinterest! Thanks so much for reading May 🙂 Glad you enjoyed it! Short & sweet with lots of timely information. Great post! Great tips thank you so much! Perfect timing as I’m starting to grow my Insta account @renegadesofchic, thank you thank you thank you! This is an amazing post!!! Thank you so much for sharing and having so many examples!!! Thanks so much Morgan! I’m glad you got something out of the post and happy you liked the examples 🙂 Thanks for stopping by! I truly needed to read this post. 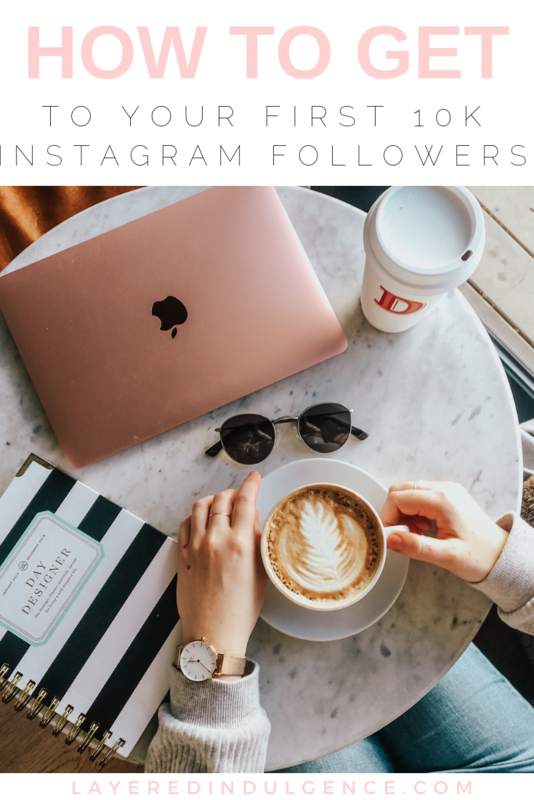 I have decided to start growing my Instagram and this is truly helpful! Thank you so much! I do have one question though: would you recommend creating a separate account for your blog/brand or just using your personal account? So happy to help 🙂 Love your page!!! So I definitely had to come check out this page since I said I struggled with this! I’ll definitely look into that app. I’m finding it’s hard as a lifestyle blogger since I don’t have one set topic, besides posting my dance pics which is a little different. Also so many great Instagram accounts look like they take their picture with professional cameras, but half of my pics are from my iPhone. Hi Shaina! I take all of my photos on my phone as well and I know some of the popular Instagrammers I follow use a mix of phone and camera, so it;s possible to have a great feed with a phone camera – they are so advanced these days 🙂 PicTapGo is honestly amazing, I can’t recommend it enough! It will totally transform your photos! Such great ideas! Thank you!! Thanks so much for reading and commenting 😀 Glad you enjoyed the post! This really helped me when it comes to instagram. I am a very new blogger and am looking for the most clear and concise information. This was a great article. Such a helpful article! Great tips! Hi Charlotte! I love that you are trying to make your Instagram look great for YOURSELF! I think when you do that you will attract a following and tribe that loves your work too! Thanks so much for stopping by and I’m glad you find my tips helpful! this helped me alot thanks! Amazing, so happy to hear that Zealah! My name is Nichole, and I’m still in the process of setting up my blog. I really don’t know where I’m going with it just yet- so I’m basically setting up the site itself, and will move onto focusing on content. I just wanted to say how well written, and aesthetically pleasing it is to maneuver your site. I’ve been visiting blog after blog to get inspiration, and I’ve found yours to be quite useful. Your honest about your blogging journey, and I appreciate that. So helpful Love your instagram!! Which filters do you use on pic tap go? Thank you! I’ve been having such a hard time with using the EXACT same filter/edits for each photo to be consistent but they struggle to look the same because of light, etc. so they need some tweaking. You have some great tips – thanks for sharing! You’re so welcome Lexi! It definitely helps to spruce up on tips from time to time and I’m happy I could help! 🙂 Thanks for stopping by! This was really helpful!! My mom has actually wanted to start a blog for the longest time. Her lifestyle as a realtor, mom, wife to be, and wonderlust personality gives her a great platform I think to become one, she loves writing. I am doing research to help her on the photography and editing part. Have you done a post about how to use pic tap go? I have that one my phone as well and although I try to do a bright and airy filter, I don’t think I’m choosing the write filters or adjusting them properly once added. Any tips on this? I know this is an older post but still incredibly relevant!! thank you so much, this is wonderful! Thank you so much! I’m so happy you enjoyed it! very nice post keep it up. Oh my, dear Kate! Instagram is my favorite social media as well! Your tips are on point! I’m about to go follow you! ( Lo at large! ) I’ve stumbled across a few of your posts! They’re always so informative. I’m a new blogger, just recently launched my site 3 days ago! I would love any advice you could give me! Love your post. Will definitely use these tips on my instagram account! Thanks! You are so welcome!! Glad you love the tips! Love these tips! I just started a new insta for my rebranded business. I’m trying to be very conscious of brand and theme on this one. My other accounts have been more personal and whatever I felt like posting. Super helpful! Really great tips here. You got right to the point and it was very easy to read. Thank you!